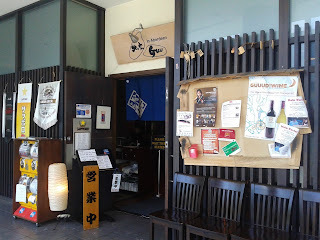 Feeling too lazy to make breakfast, I decided to head over to the Japanese-operated Guu Richmond in Aberdeen Center and have an early lunch instead. I was intrigued by the Creative Gunkan on their menu, and seeing how they were each $3 a piece, I dished out some extra cash so that I would be able to try as many of them as possible. 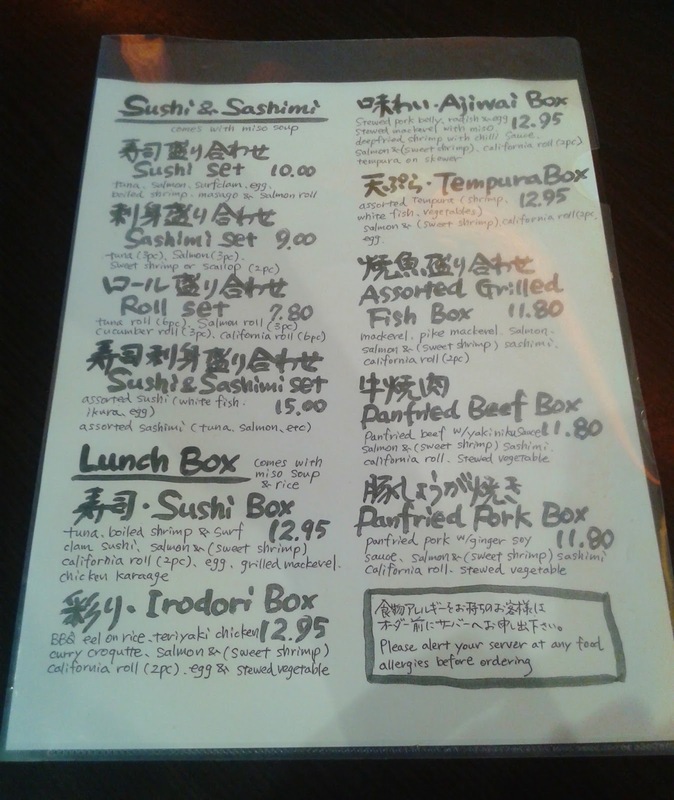 My fillers would be the $6.80 Okonomiyaki and the one of the special rolls. It was the perfect plan. Little did I know that I was looking at the dinner menu rather than the lunch menu. Oh, the horror. My dreams of having creative gunkan, okonomiyaki, and a special roll were all crushed in one fell swoop. Instead, I was presented with their lunch menu, where everything was organized into meals and diners would just choose their favourite one. Due to the reduced number of options, it did not take me long to decide on the Irodori Box (meaning "bright colours"), which came with BBQ Eel on Rice, Teriyaki Chicken, Curry Croquette, a Mini Macaroni, Salmon Sashimi, Tuna Sashimi, Hotategai Sashimi (I assume they ran out of sweet shrimp), a California Roll (two pieces), Tamago, Stewed Vegetables and Miso Soup. The bright sight of so many goodies neatly placed in a lunch box put me back in high spirits. 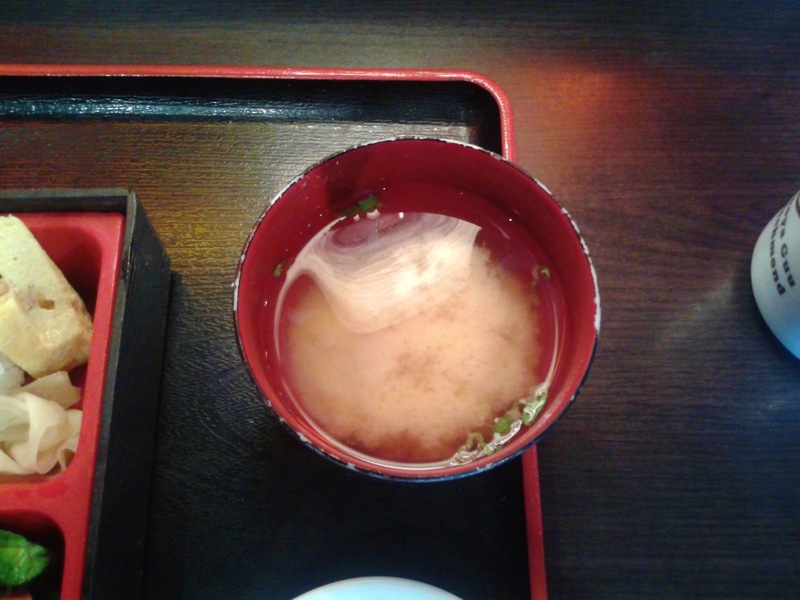 The Miso Soup was served at a hot temperature with seaweed, green onion, and tofu. It had a pleasant, well-balanced flavour. The Stewed Vegetables consisted of radish, carrot, and potato stewed in an oden-style dashi broth. 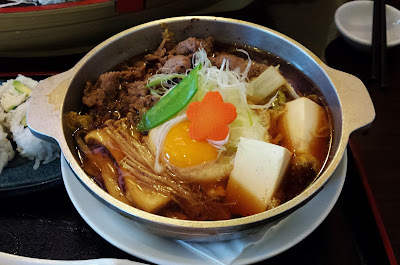 I enjoyed how this dish was light and moist, and it would be excellent if there was slightly more of the broth. 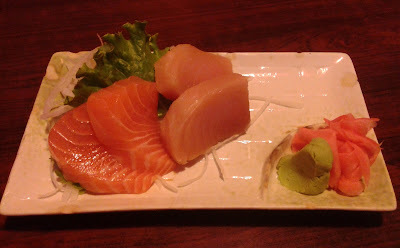 The Salmon Sashimi was especially delicious with its soft texture and smooth sheen. I would have missed out on it if I had ordered from the dinner menu! The Hotategai Sashimi had a slight briny flavour like amaebi and was delightfully soft and pillowy. The Tuna Sashimi was not as fresh as the salmon. 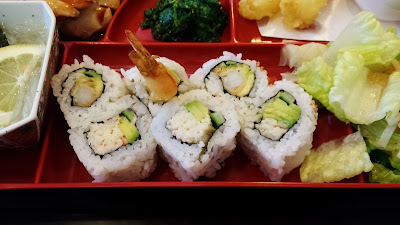 The California Roll did not look like it would be any good due to the huge amount of rice, but it tasted surprisingly decent since the imitation crab meat was so rich in flavour. If the rice had not been mushy in places, it would have received an A-. The Tamago was slightly sweet, and most of it had a soft, fluffy texture. The unagi on the BBQ Eel on Rice was soft but would have fared better with more teriyaki sauce. 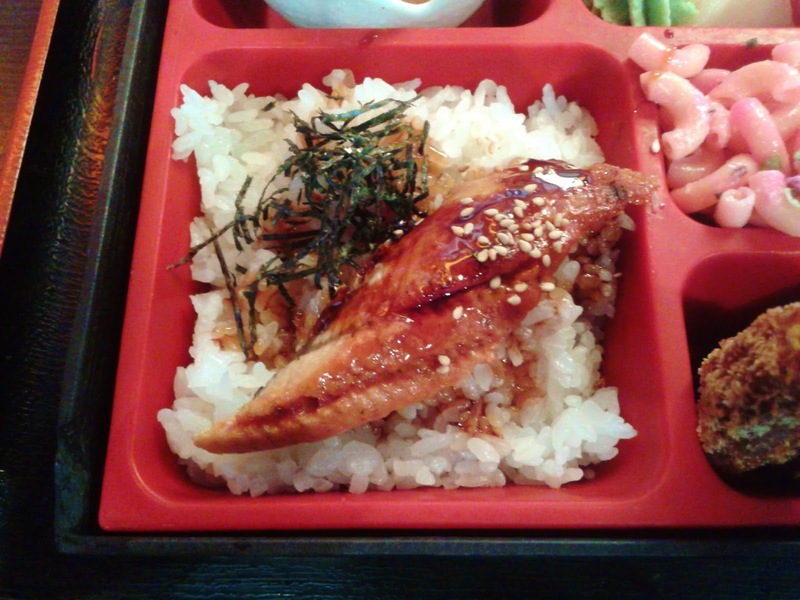 The steamed rice was decent and went well with the unagi. The Mini Macaroni was quite unremarkable aside from its curious pink colour, and I found it a little dry. However, the Curry Croquette was decent with its crispy panko batter and the addition of Worcestershire sauce in just the right amount. 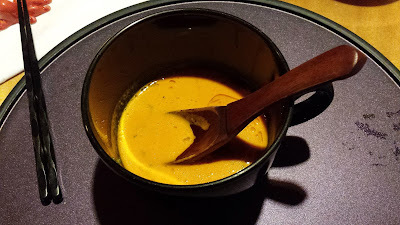 It had a rich curry flavour and was not hard. 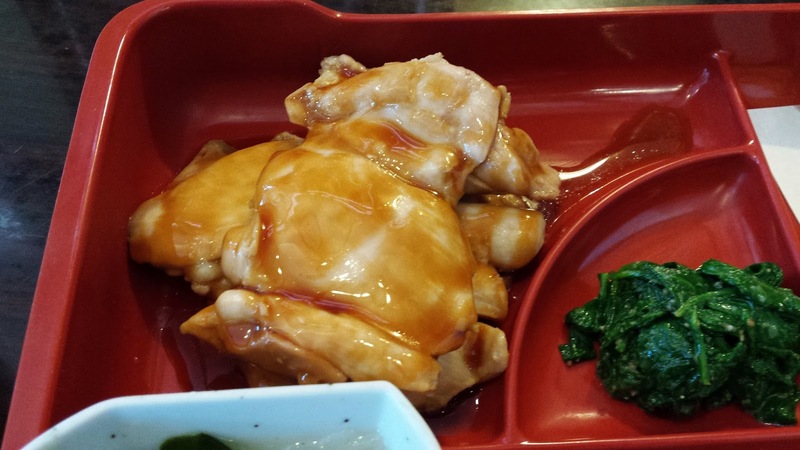 The Teriyaki Chicken, although a tad dry, was tender and well seasoned. The restaurant was rather empty (which I think is largely due to my early timing), so the service was adequate. Most of the items in the Irodori Box were well-executed, and I found the Irodori Box quite filling. 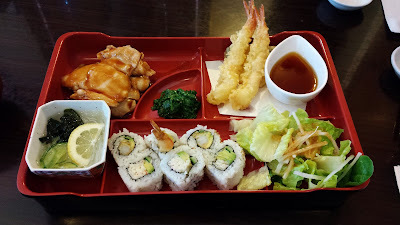 There was no way I could finish another lunch box, so I finished my meal with only a $13.60 bill (including tax), which is the lowest out of all my sushi adventures so far. I suppose that is the bright side of ordering from the lunch menu. Last Tuesday, my friend Michael, my family, and I went to The Zone Bowling Centre, where I was ecstatic to show off my fantastic bowling skills. It's only $2 a game on Tuesdays, so why not? I forgot how to play without the bumpers raised, so we went for some five-pin bowling, where I managed to get one spare in two games! 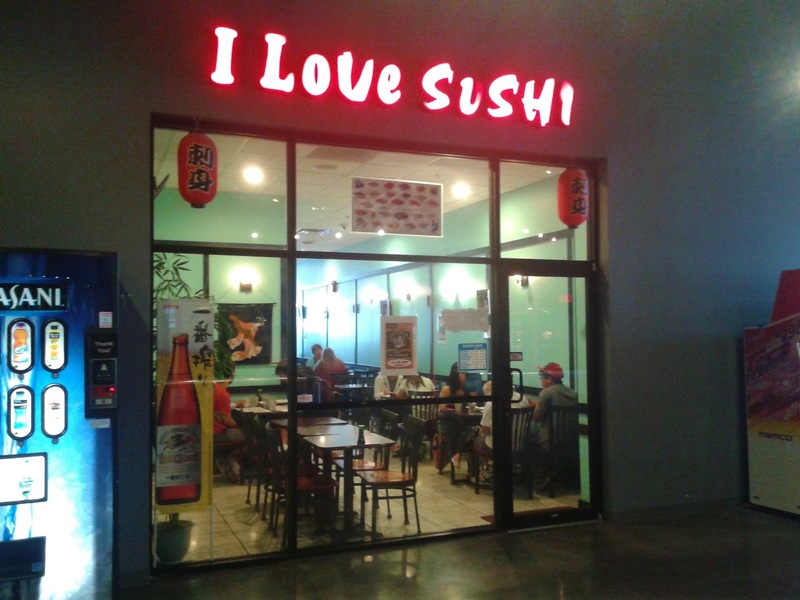 Feeling high-spirited, I decided to celebrate by dragging everyone to I Love Sushi, which is conveniently located in the same building as the bowling center. I Love Sushi is popular with bowlers and movie goers (there is a SilverCity right across the street), and it was no surprise that the restaurant was quite busy on a Tuesday evening. Both The Zone Bowling Centre and SilverCity offer deep discounts on Tuesdays. Unfortunately, I Love Sushi does not offer discounts on Tuesdays, but that wasn't much of an issue to us since the prices there are not particularly high to begin with. At the start of our meal, we were presented with a small complimentary bowl of Edamame. 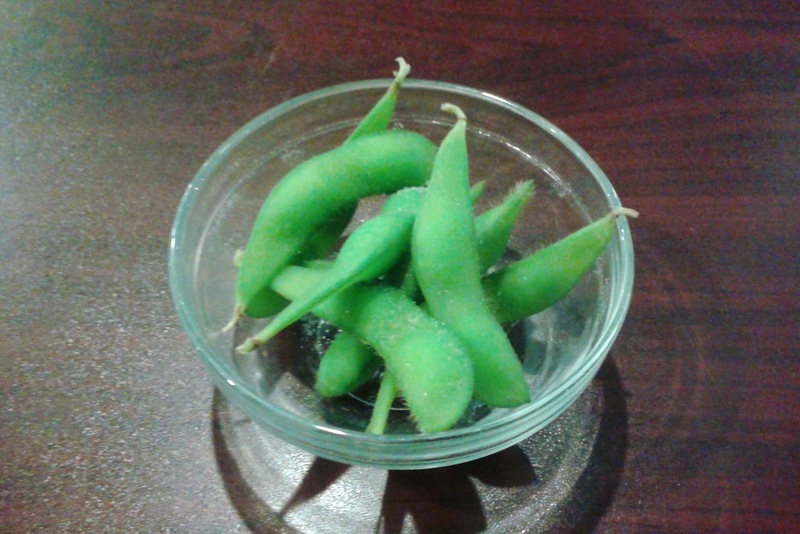 The flavour of the Edamame was decent, but I found it a touch too dry. Other than all-you-can-eat restaurants, this is literally the only place I have seen where you can get Sockeye Salmon Sashimi for less than a buck a piece. The Tuna Sashimi was cut into large pieces, but it was quite firm in texture. The Sockeye Salmon Sashimi, however, was softer than the tuna and had a nice sweet flavour. Michael does not eat tempura unless it's part of a roll, and he was definitely not enticed to try it after seeing my reaction. 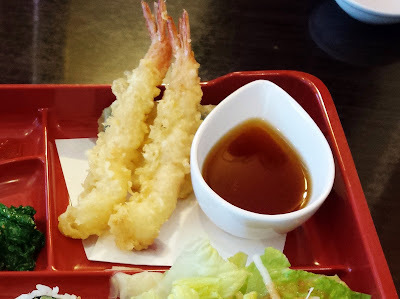 Although the prawns themselves tasted decent, they were surrounded by a thick, heavy layer of batter that was as crunchy as a burnt pizza crust. However, since my sister was fine with the thick batter, I didn't have to be the garbage can. 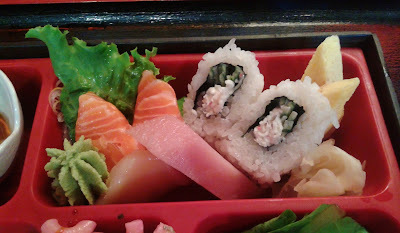 The Rock & Roll consisted of a Dynamite Roll topped with smoked salmon. 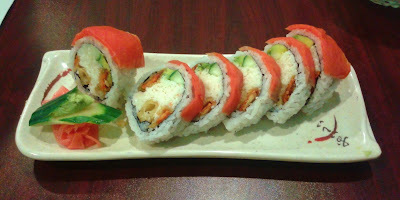 I liked the sweet smoked salmon on top of the roll, but the batter on the tempura yam and tempura prawn was terrible. Eating this roll reminded me of eating a seeded mandarin orange - mostly soft with those few annoying hard parts that I want to spit out but am too lazy to. One of us ended up eating the slice of cucumber with all the wasabi in it by accident (that didn't go very well). Ahh yes, the TREO Roll. There's no better experience than thinking about your beautiful Port Mann Bridge crossing fees while enjoying your sushi. This roll came with tuna tataki on top of a California Roll. Although it wasn't first-class, I still enjoyed the seared tuna on top for its lightly grilled flavour. I found the roll slightly too acidic in taste due to the addition of lemon juice. It would be nice if they provided a slice of lemon on the side instead. Of course, we needed to order my dad's favourite dish, the Teriyaki Chicken. My dad and I both enjoyed the chicken, which was tender with a slight crispiness. The sauce was quite savoury and went well with the chicken, and the amount of sauce was just right. 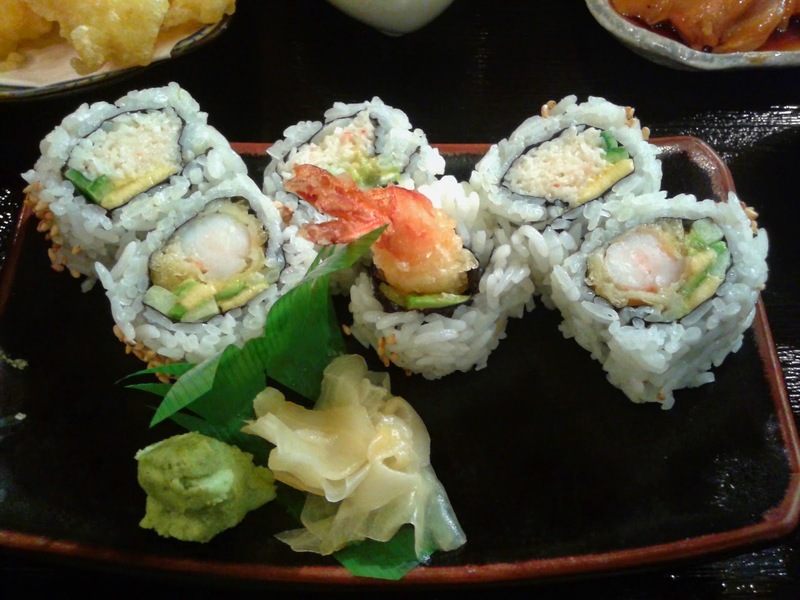 The hit of the evening was the Honey Roll, which came with avocado, crab, yam, and baked scallop. 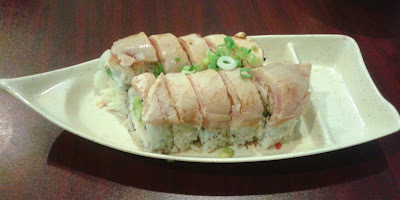 The creamy, cheesy layer on top had a delicious, harmonized sweetness, and the process of baking the roll with the sauce helped to alleviate some of the dryness I experienced with the other rolls. There was also a subtle spicy kick, which I enjoyed, and the baked scallop was delightfully sweet and soft. Despite the fact that the restaurant was relatively busy, there was adequate service throughout our meal. 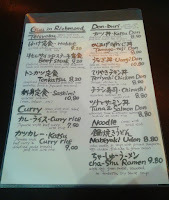 The menu has a very good variety of items, and the food comes out in a timely manner. There are better and cheaper options nearby, but this place remains popular due to its convenient location. My past sushi adventures to Steveston have been met with some of the freshest sashimi I have ever had. Well, that figures, since there is a fisherman's wharf at Steveston from which restaurants can acquire the freshest fish. Sights at the wharf include live uni (sea urchins) with moving spines, the huge line-up at Pajo's Fish & Chips, and people who walk around with selfie sticks. I brought my mom and dad to Ichiro Japanese Restaurant so that they could try some of the fresh sashimi that Steveston has to offer. I was surprised to see the restaurant only half full (it was jam-packed during my visit on a chilly November evening), and even more surprised when I was greeted by a waitress who snapped at me for being 10 minutes late for my reservation. 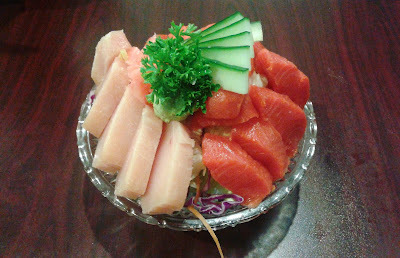 During my last visit, I was thoroughly impressed with the sashimi, so this time, I was quite adamant about ordering the Sashimi Boat Set despite my mom urging me to get either the Chirashi & Noodle Set or the Sashimi & Noodle Set instead (as these were cheaper). Perhaps I should have listened to her instead, as the sashimi turned out to be all over the place in terms of quality. The highlights include the deliciously smooth Tai Sashimi and the soft Tuna Sashimi, while the lowlights were the Tako Sashimi and the Hamachi Sashimi, both of which were devoid of flavour. On the front side of the boat sat a small appetizer comprised of various small pieces of sashimi (sockeye salmon, tai, and tuna) dressed with a light, gingery, soy-based sauce. This helped enhance the flavours of the fish further, which I enjoyed. A bowl of Miso Soup and a bowl of steamed rice (not pictured) also accompanied the Sashimi Boat Set. 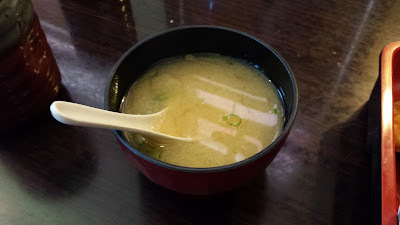 The Miso Soup came with tofu, green onion, and seaweed. It was not particularly rich in flavour, but the consistency was good. 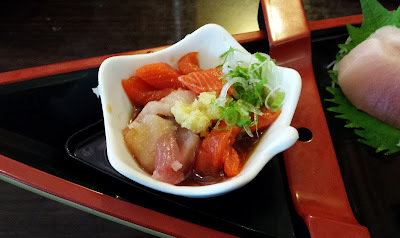 A small dish of daily appetizers rounded off the Sashimi Boat Set. 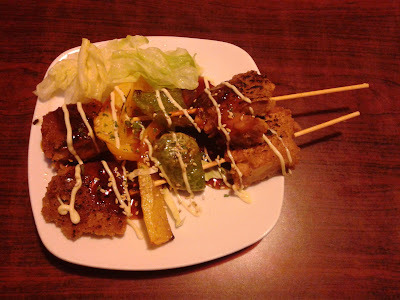 I enjoyed the Deep-Fried Chicken, which was tender, juicy, and aromatic. The batter was light, crispy, and well-seasoned. The filling for the Spring Roll was weak in flavour, but at least the crunchy pastry was not hard to chew. The Gomaae came with very soft baby spinach dressed with a rich sesame sauce, and was my favourite out of the three items on the dish. 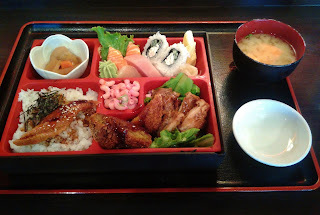 Next, we had the Fuji Lunch Box, since my dad's requests were chicken teriyaki and prawn tempura. The lunch box came with Chicken Teriyaki, Gomaae, Tempura (4 pieces), Sunomono, a half Dynamite Roll, a half California Roll, a Green Salad, and a Miso Soup (not pictured). 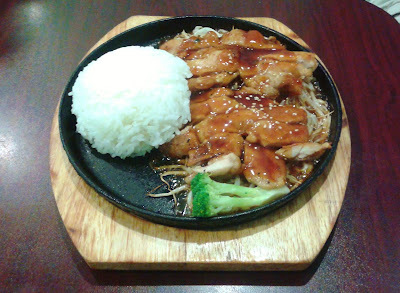 The Chicken Teriyaki was tender, juicy, and savoury. However, it doesn't look particularly appetizing due to its overly plain nature. I would have liked more of a grilled flavour or the use of something like sesame seeds or pepper. 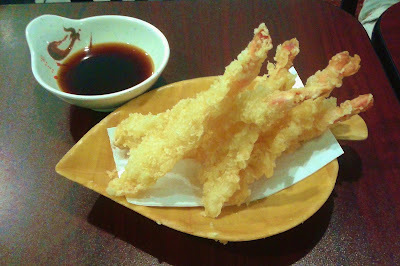 The Prawn Tempura (2 pieces) was again excellent due to the nice flakiness of the batter and the meaty prawns. 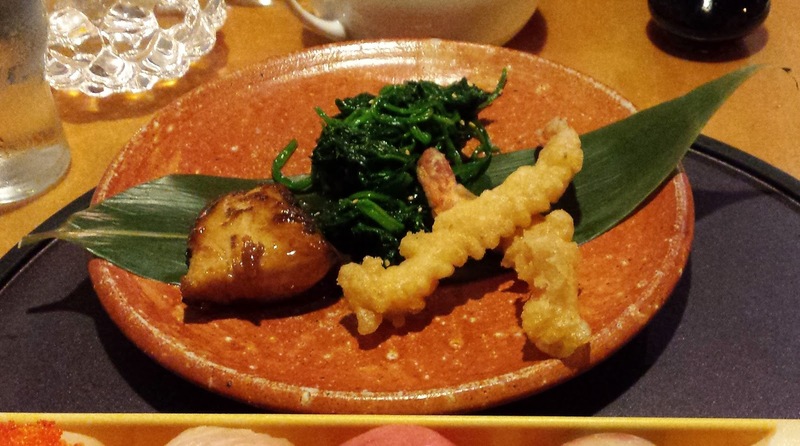 The one piece of Zucchini Tempura was juicy, while the one piece of Yam Tempura was slightly stiff. Since I'm the only one in my family who actually likes sunomono dishes, I got to have this all to myself. 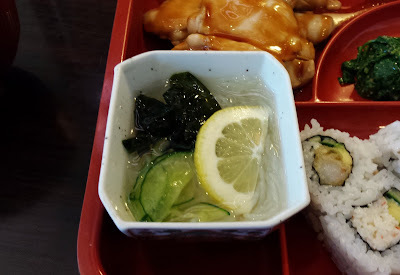 I don't blame my parents though, since the only sunomono they have had was from Ninkazu (and it was chock full of vinegar). Now, if only I could pour some of that vinegar into this Sunomono, as this one was too sweet and didn't have much of a kick. This was one of the better Green Salads I have had. 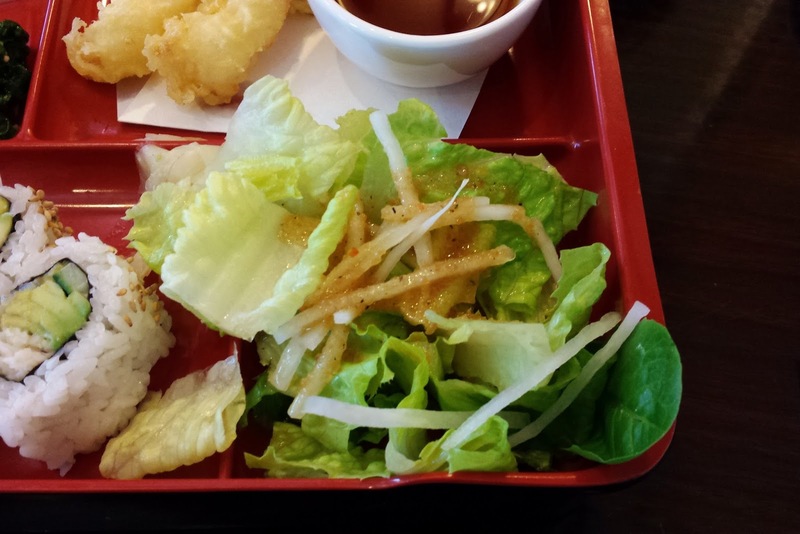 It consisted mainly of lettuce and a slightly tangy Japanese salad dressing. There were also a few strands of radish mixed in for a unique touch. 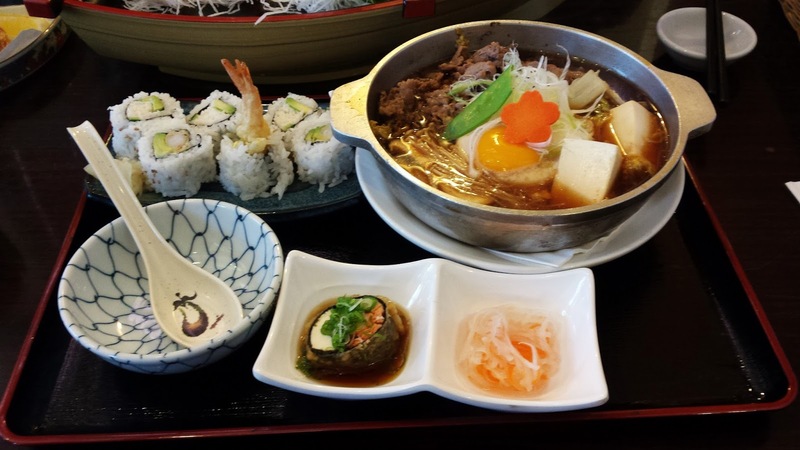 We also ordered the Sukiyaki Set, which came with a half California Roll, a half Dynamite Roll, a Sukiyaki Hot Pot with Udon Noodle, and an appetizer. 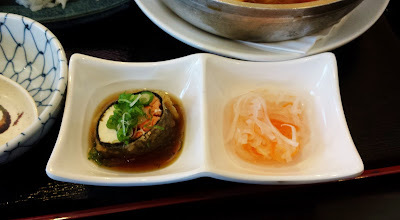 On the left side is an appetizer consisting of fried seaweed, salmon, asparagus, crab stick, and tofu. I enjoyed the crispiness of the fried seaweed, and the light soy helped to accentuate the flavours of the ingredients inside. On the right is another appetizer with shredded radish and carrot that I did not try. Other than the incident where I was snapped at for being late, the service was decent. 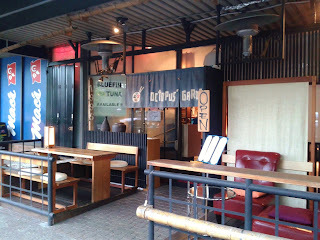 I also liked the atmosphere and the comfortable seating inside the restaurant. The food had noticeably declined in quality since my previous visit, and there were no A+'s to be given. It could also be that they're just not very good with consistency. However, the overall food quality is still slightly above average, and the total bill for all three of us was less than the bill for my previous visit, when I had dined all by myself. After writing blog posts for Sushi California, Sushi &, and Hanamori Sushi, I was on a quest to find another sushi restaurant near Lougheed Town Centre to try out. Browsing through the online reviews did not provide me with a clear target, so I decided to just go for the restaurant with the lowest prices. That way, if the sushi was good, I would not have to pay as much, and if the sushi was bad, I would not have to pay as much either. It was the perfect strategy, or as some of my professors call it, the "dominant strategy." Okoman Sushi is just a short uphill walk from the Walmart at Lougheed Town Centre, but somehow, I manage to get totally exhausted by the time I got to the restaurant. I blame the heat. When I stepped into the restaurant, the first thing I noticed was that most of the dining tables were separated by wooden dividers for enhanced privacy. For added elegance, each of these dining tables were illuminated by a bright Japanese lantern above. There is a button that you can push whenever you require service. 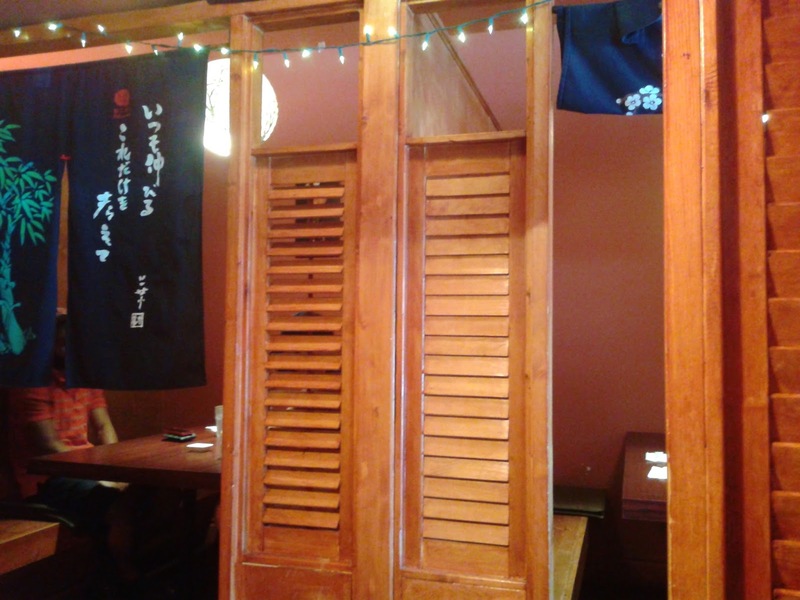 I was originally seated next to the sushi bar, but since I kept peering at the lantern-lit private "rooms" like a curious animal, they offered to seat me in one of those rooms. I gladly accepted the offer as it would allow me to take as many pictures of my food as I wanted with privacy. I slowly combed through their extensive menu, which included an array of appetizers and robata dishes in addition to the typical Japanese items. Interestingly, the first item to arrive was the Yakitori, which came with two skewers of barbecued chicken and vegetables. The bell peppers were juicy, and the chicken was slightly breaded so that it had a bit of a crunch. I enjoyed this unique touch. There was some slight charring, but the chicken remained tender. The Appetizer Sashimi came with two pieces of Salmon Sashimi and two pieces of Tuna Sashimi. The salmon was buttery, soft, very fresh, and cut into good-sized pieces. Yes, I am fully conscious of the fact that I am giving this the same grade as the Salmon Sashimi I had from Octopus' Garden. The Tuna Sashimi was delightfully soft as well with a decent, rich flavour. This was definitely the highlight of the meal! Unfortunately, the Ebi Mayo was a roaring disaster. The batter was thick and chewy like gummy candy. Did they accidentally drop glue into the frying oil?! Even though the shrimp inside tasted good, I was mildly disgusted by the gross, gummy batter. Not wanting to waste food, I peeled off all of the batter and ate the shrimps. Let's not think about the batter anymore and just move on to the next item. 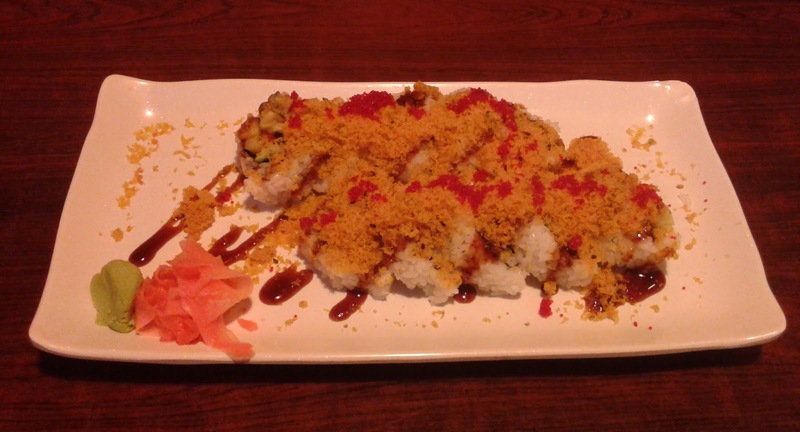 The Okoman Special Roll (10 pieces) consisted of deep-fried scallop, eel, cucumber topped with crispy powder, tobiko, and unagi sauce. Presentation-wise, the roll looked promising with the colourful abundance of panko crumbs on top. However, I had a lot of trouble chewing the tough seaweed and tasting any of the ingredients inside the roll. There was no way I would have noticed the deep-fried scallop had I not seen it listed as one of the ingredients and subsequently picked the roll apart. Sitting at the private rooms came at the price of very minimal service. I understand that I should press the button when I am ready to order, but I don't think I should have to press the button to have my tea refilled occasionally or have the server ask me how my food was, especially since the restaurant was mostly empty at the time. At the end, I just took $2 off the tip so I could buy myself some iced tea at Lougheed Town Centre instead. 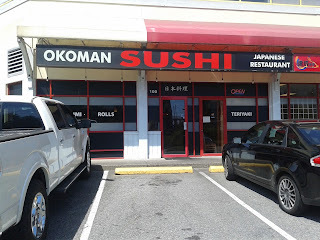 In order to celebrate my 100th sushi adventure since starting this blog, I decided to make it very special by taking my mom to an omakase dinner at Octopus' Garden. My mom is an excellent cook, but for all these years, she's been having bang-for-your-buck sushi and enjoying sashimi for its quantity rather than its quality. I decided that it was time for her to experience something a little more refined and sophisticated. As expected, she was very shocked to learn about the rather hefty price tag: $75 per person! Up until this point, she had never had any food remotely close to that price range. She spent nearly an hour getting dressed up and making sure that her appearance was immaculate for the dinner! Octopus' Garden is located just west of the Burrard St. Bridge and is owned by the head chef Sada-san. Octopus' Garden is one of the few sushi restaurants in Vancouver to serve omakase (literal translation: "I'll leave it to you"), a special dining experience in which the diner leaves the selection of dishes up to the chef. At Octopus' Garden, there are two types of omakase, one priced at $75 and the other priced at $100 (we went for the $75 one). 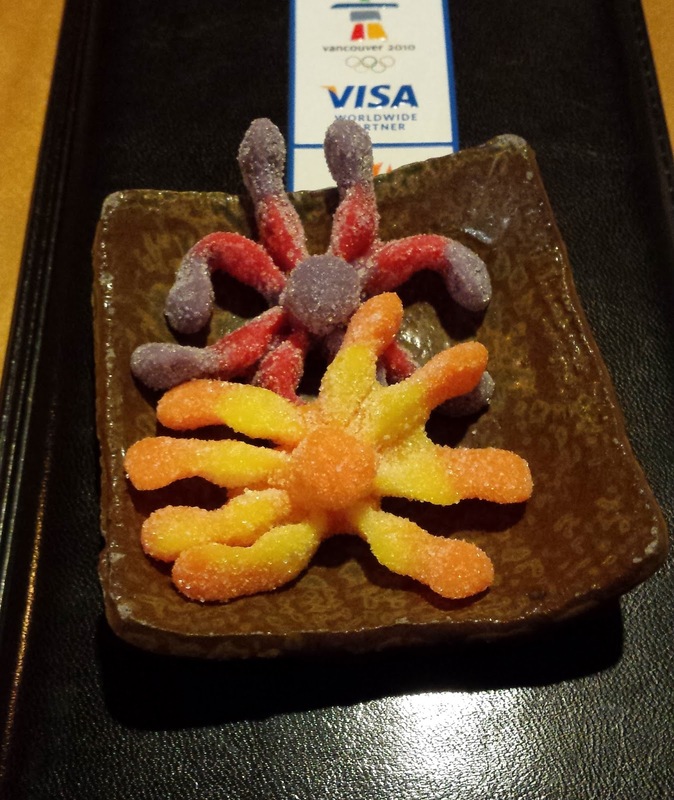 A few food bloggers have mentioned that the omakase at Octopus' Garden can take upwards of two hours, so I snacked on gummies for the entire car ride there to ensure that I wouldn't be starving while I waited for my food. 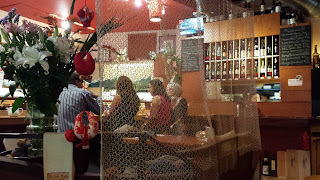 When I arrived, I was courteously seated next to the window (as the bar was completely booked), and I had a few moments to enjoy the Beatles music in the background before the first dish came. The restaurant was not as large as I had expected. In addition to the regular tables, there is a bar that seats six people as well as a wooden boat (pictured above) that seats two. The boat is set up like one of the short tatami tables you would find in a traditional Japanese room, so you can either sit in a seiza position or sit cross-legged. I cannot sit in either of these positions (yes, elementary school assemblies were a form of torture to me), and would probably end up eating my meal in a sleeping position instead if I were seated at the boat. That would not look very graceful. However, for those who can sit cross-legged, it might be an interesting experience. 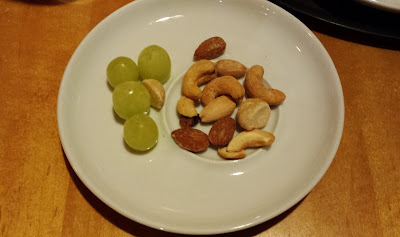 At the very beginning, we were given a small dish of grapes and cashews to entertain our palates. The omakase also includes the choice of a tea ($3 if ordered à la carte), so my mom chose the Matcha Genmai (green tea with roasted brown rice). I'm no tea connoisseur, but I wasn't heavily impressed by the tea. It also took a while for the tea to absorb the flavour of the brown rice. 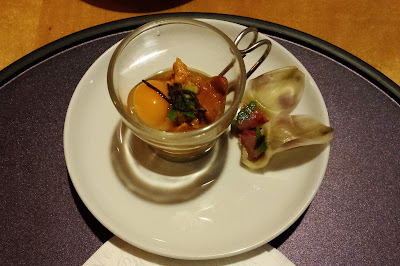 'Sada's Own' Nomu Uni Shooter consisted of sea urchin, mountain potato, quail egg, and wasabi in a small glass of dashi broth, mirin, and rice. You're supposed to mix all of the ingredients together and then consume the whole thing in one gulp. The result is a highly pleasant savoury smoothness from the uni and quail egg, which blends perfectly with the broth. The rice prevents the shooter from tasting too much like a slimy, slippery concoction. 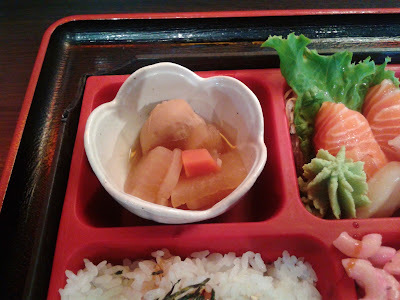 On the side were two miniscule pieces of hamachi neatly placed on artichoke petals. The piece of hamachi is to be eaten along with the folded portion of the artichoke petal at the same time. I had an epic fail moment and accidentally consumed them separately even though the waiter told me not to. The Scallop and Ankimo Salad came with mixed greens, green beans, a few pieces of cucumber, a juicy grape tomato, quinoa, some lightly cooked scallops, and ankimo (monkfish liver). Seasoning was used to enhance the flavour of the ankimo, which had an excellent briny sweetness itself. 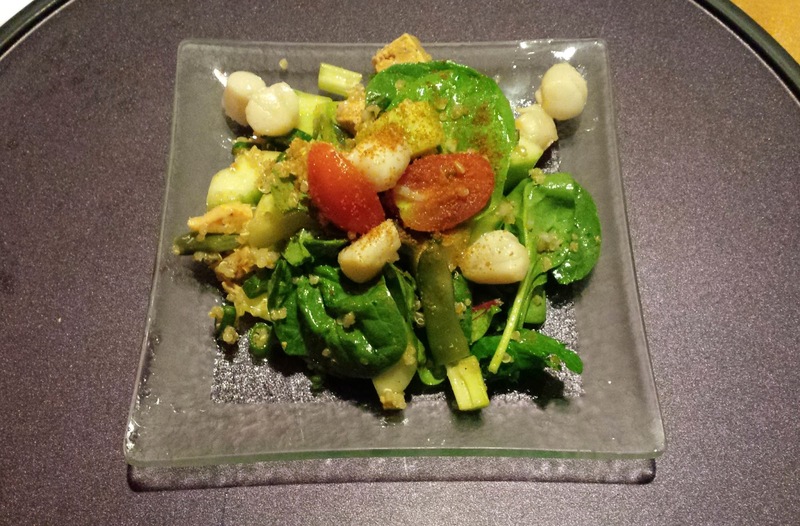 The scallops had a nice bounce to them, and overall, the salad was a nice light and refreshing prelude to the heavier dishes which were about to arrive next. The first thing I noticed about the western-style Carrot Soup was the rich, irresistible aroma of melted cheese. I got a little ahead of myself and started savouring the soup before taking a photo of it, until my mom suddenly stopped me and asked, "Did you take a photo yet?" Oops! Well, this is what the carrot soup looks like after about 10 sips. With its flavour enhanced by the melted cheese and the small bits of green onion, this was one freaking delicious Carrot Soup! With just five pieces of nigiri, I was blown away three times, and this was undoubtedly the climax of the omakase. The scallop was delightably soft and had a delicate briny flavour, while the tobiko on top added a nice crunch. The Albacore Toro Nigiri was simply amazing. The mouthwatering, buttery flavour of the toro and the masterfully constructed sushi rice just melted exquisitely in my mouth. The same goes for the Blue Fin Otoro, with its unmistakable fattiness and juiciness. 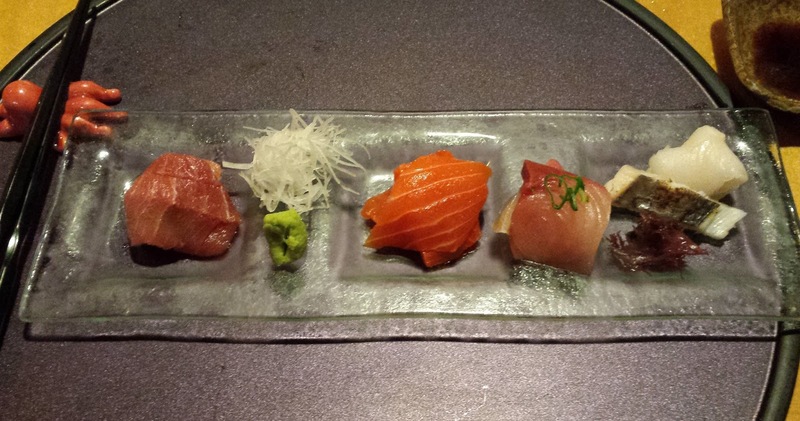 The Shima-Aji Nigiri was also a huge delight, with its subtle, sweet flavour and perfectly smooth texture. The Butterfish Nigiri was decent and had a soft flakiness to it. The cooks in the kitchen weren't as talented as Sada-san. 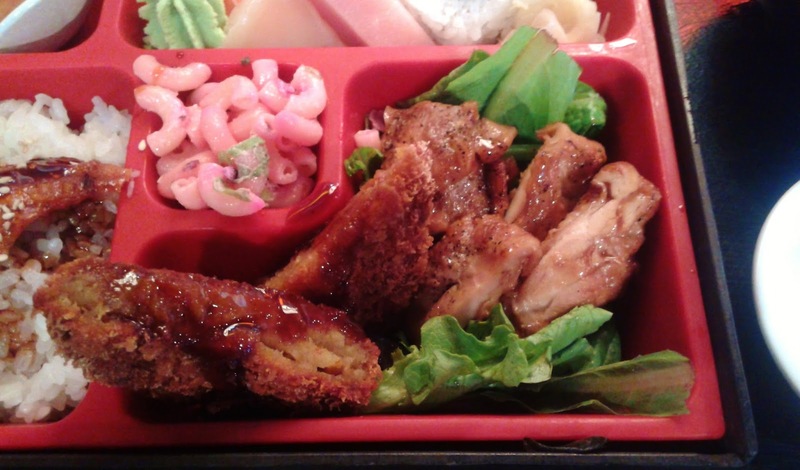 The Teriyaki Buri (yellowtail) was tastefully dressed with some light teriyaki sauce, but it was overcooked. The Spinach was rather mature and both my mom and I had a bit of trouble chewing it. 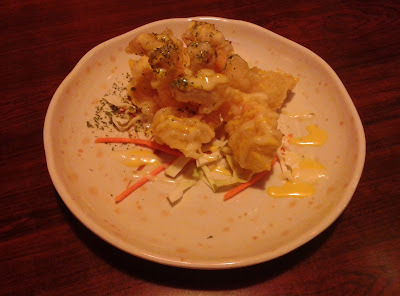 The spot prawns were very fresh and meaty with an excellent snap, but the tempura batter was a bit greasy and hard. Next, the small dessert platter arrived. The Black Sesame Ice Cream was great with a sweet and distinct sesame flavour. The Pistachio Macaron had a soft, sweet filling, but it didn't have a prominent pistachio flavour. The sweet custard of the Red Bean Crème Brûlée blended smoothly with the small dab of red bean paste at the bottom. 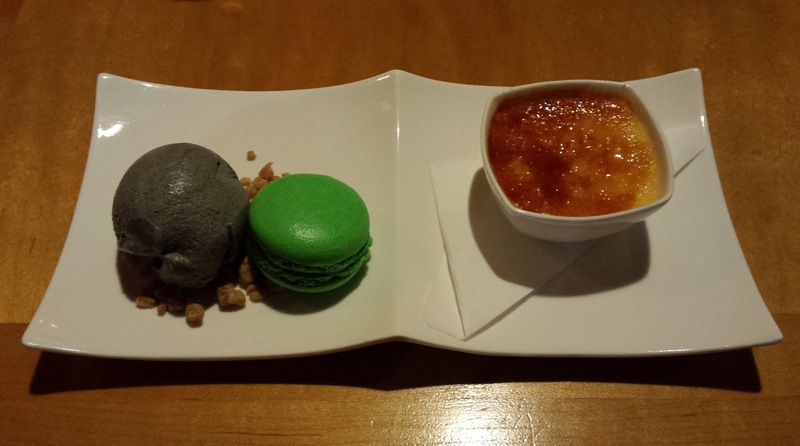 I would have preferred a thinner layer of hard caramel on the top, but overall, I still enjoyed the crème brûlée the most out of the three sweets. At the very end of the omakase, we received our gummy octopi! What a great way to incorporate the name of the restaurant into the meal! My mom took one look at them and exclaimed, "Oh my gosh! They're spiders!" I immediately felt the need to do a facepalm, although I could see where she was coming from. 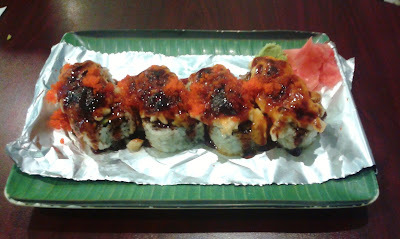 For the highest price I have ever paid for any meal, I received some of the best sushi I have ever had. If the kitchen staff had executed the cooked dishes well, this would have been a nearly flawless meal. My server wasn't very proficient at English, but he was very patient even when I asked him to say managatsuo over and over again while I wrote down "nanagatsuo" in my notebook (a complete fail on my part). He was also very attentive, and the arrival of the dishes was well-timed. I look forward to experiencing the more luxurious $100 omakase someday!